Microfiltration cartridge of Crystal ECO ensures 99.99% protection from bacteria, cysts of parasites, suspended particles, rust, silt. All under-counter water filters of Crystal family are more compact compared to classic trio under-counter systems while containing same amount of sorption filling as traditional 10 inches modules. The housing is designed to withstand massive water pressure, is extremely easy and safe to change still secure from accidental removal. Reduce 99.9% bacteria and cysts. Crystal Eco is perfectly suitable for allergy sufferers, children, seniors and those who have sensitive digestive and immune systems. It provides chemical-free removal of microorganisms in water using hollow fiber microfiltration membrane which prevents particles down to 0.1 microns in size from sneaking into your drinking water. 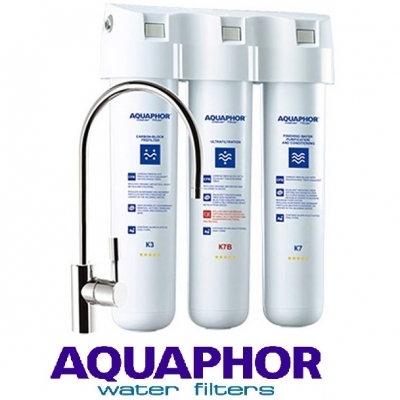 This is a three-stage water filtration system which offers high quality water filtration using the latest activated carbon block technology. This system uses a composite carbon block filtration matrixes which includes a pore size of 0.1, 0.8 and 5 micron and has an increased amount of activated coconut carbon which will safely remove chlorine and any other unwanted chemicals, bacteria, lead and other harmful heavy metals, phenol, pesticides, benzene, volatile organic compounds, insecticides, pesticides, industrial solvents and many other common impurities. This system offers substantial filtering performance for its size and will greatly enhance the quality of your drinking water.